On the last day before the autumn holidays, their talents were represented by 4-grade pupils within the artistic marathon “Talents is your third school”. The original and unexpected numbers were greeted by audacious applause. In the nomination “Musical Art”, Yelyzaveta Komiz and Eliza Sabadash (4B) presented the students all the podium essays, and Vladyslav Kirichenko (4B) created a good mood for the audience with a virtuoso guitar playing. The greatest number of participants was presented in the nomination “Choreographic Art”: Anastasia Pokalenko (4B), Nikita Hora (4B), together with Viktoriia Dunaievska, who was studying in the gymnasium № 9 performing the dance “Cha, cha, cha”. Alina Lekhkodukh and Kristina Liapkalo (4A) conquered the audience with choreographic compositions “Funny Legs” and “Modern”. 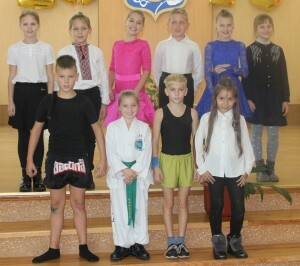 Pavlo Khripko, Vira Kolomiets, Artem Makhin and Eleonora Datsik (4B) demonstrated multi-genre performances in the nomination “Gymnastics, sports sketches and acrobatics”. The wonderful song “Toys”, in the nomination “Vocal Art”, performed by Sofia Murashkina (4B). After the autumn vacation we invite all those who wish to continue the artistic marathon “Talents is your third school”. The best creative abilities will be demonstrated by pupils of 5-8 grades. We are waiting!